The heartwarming story of a wheelchair bound young boy and his friends who reunite a family of stranded space aliens and take them to McDonalds! 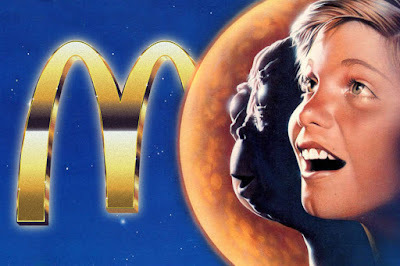 It may not come as much of a surprise that The Golden Arches Overlords funded this movie with the idea that some of the profits would go to funding the Ronald McDonald House Charities. Word has it both Anjelica Huston and Kim Basinger were offered the female lead in this film. Alas, both declined. Now is YOUR chance to see this forgotten "classic"!